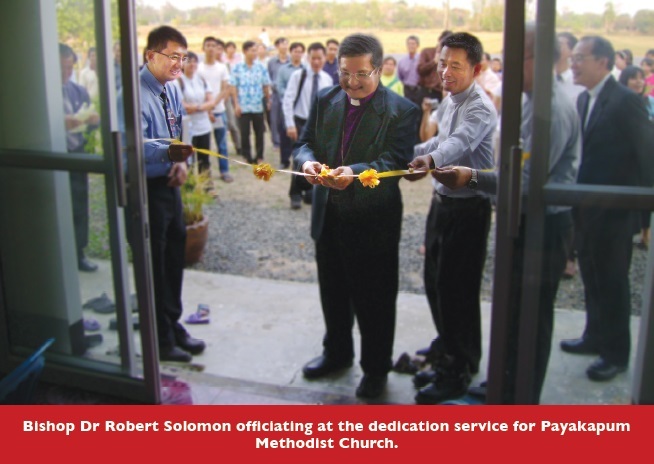 CHIANGMAI – It was a time of rejoicing in Thailand when Bishop Dr Robert Solomon and Methodist Missions Society (MMS) directors and church leaders from Bukit Panjang Methodist Church and Wesley Methodist Church arrived here for a series of events held from March 10 to 14. The Bishop and the MMS team flew into Chiangmai on March 10 to attend the 6th Annual Meeting of The Methodist Mission in Thailand. 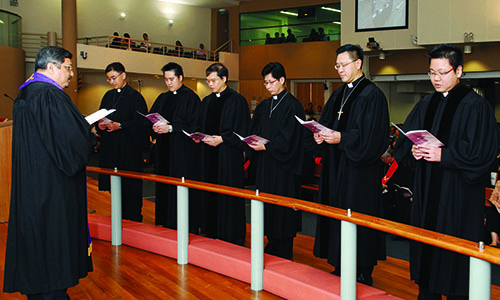 Together with leaders from the two churches, they attended the ordination service for three Thai pastors. They also attended the dedication services for the Payakapum and Nong Bua Lumpu church buildings. On arrival around noon time and after a quick lunch, the candidates for the ordination were introduced by the Rev R. Prabhu, a representative of the Field Board of Ministry, and questioned by the Bishop. 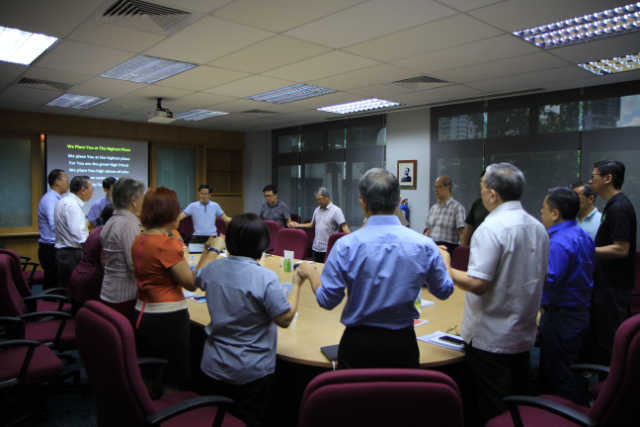 The Singapore team then proceeded to Shineforth Church sanctuary for the 6th Annual Meeting. For the first time, the District Superintendents presented their reports. 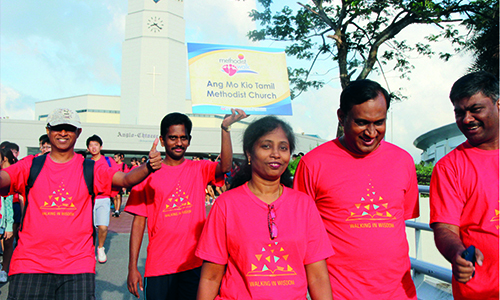 The agenda included endorsing The Book of Discipline for the Mettakij Church Association, which was approved in principle by the Annual Meeting. The Thai committee will continue to work on tidying up the Thai translation to make it more congruent with the English version. The ordination service commenced at 7.30 pm and we rejoiced to witness together with families and church members the ordination of Pastor Khem Komkai (Nong Bua Lumpu Methodist Church), Pastor Chinakorn Saengkasa (Shineforth MC) and Pastor Attaphon Kumsri (Sakhon Nakhon Preaching Point) as Deacons. The Bishop shared from Luke 14:25-34. He reminded the new ordinands the cost of being a disciple of Christ and that they are called to a position of great responsibility as shepherds of their flocks. The following morning the Bishop and the team attended the Vineyard Nursery and Kindergarten graduation ceremony. It was an occasion of great joy and celebration for the children and their parents. In the afternoon they flew from Chiangmai via Bangkok to Udon Thani Airport, north-east of Thailand. After a good overnight rest at Nongbualumpu, the team travelled by country road for five hours to Payakapum Methodist Church for the dedication service. e service was well attended by members of the church along with members and friends from several churches from as far as Burirum Province. The leaders from Bukit Panjang MC were present to celebrate God’s goodness in converting this property into a new church sanctuary from a row of two shop houses. Praise God for His provision. Bukit Panjang MC is committed to send a missionary to Payakapum MC to help in developing its Youth Ministry. After the ceremony the team drove back to Nongbualumpu. 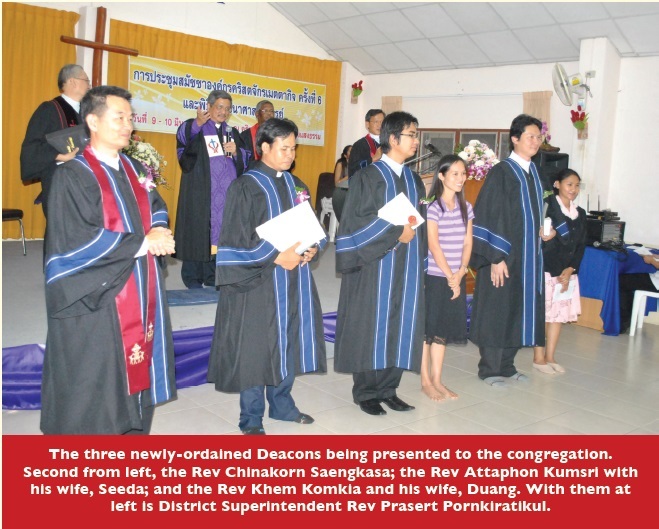 The dedication service for Nong Bua Lumpu Methodist Church was held the following morning. The church is finally able to own this property through generous donations from Wesley Methodist Church. The church structure is beautifully designed with a new sanctuary that can seat up to 100 people. The Guest-of-Honour was the Deputy Governor of the Nongbualumpu Province, who came on behalf of the Governor. Also present were the Rev Philip Lim, MMS Area Director for the Mekong Delta region, and the leaders of Wesley Methodist Church. At both the dedication services, the Bishop reminded those present that the Church will be God’s house of worship, and that many will be eager to hear His word and to sing praises to Him. The Church must reach out to the community and be a blessing to the people, added the Bishop. 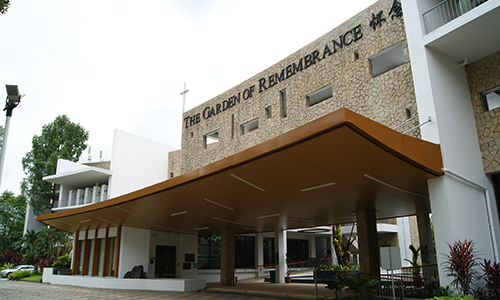 Col (Retd) Quek Koh Eng is an Area Director and Director of Operations of the Methodist Missions Society.